Did you know that California grows 95% of the world’s avocados, and that Californians are the world’s largest consumers of avocados? Avocados have a following in the cultures worldwide, but Californians put them into everything from ice cream to sushi. One of the most unusual and absolutely delightful dishes made with avocados is the Avocado Pie. Look into the family recipe books of most native Californians, and you will probably find an avocado pie recipe. There are many versions in making the pie, and they all taste wonderful! Leo Porter of Fort Klamath shared this wonderful pie recipe with me. Leo grew up on an avocado farm in California. 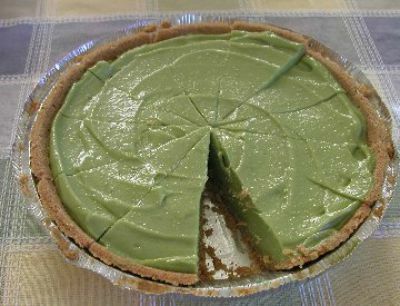 This is his version of the recipe for avocado pie that was created by his aunt in the 1970s, and is now one of his signature dishes. Learn about the History of Avocados. Also check out more Pie Recipes. Refrigerate graham cracker crust until well chilled. In a small bowl, combine lime juice, lemon juice, and unflavored gelatin; let stand 4 to 5 minutes or until softened. In a large bowl or the food processor, combine gelatin mixture, mashed avocados, and sweetened condensed milk. Pour mixture into prepared graham cracker pie crust. Refrigerate at least 2 hours or until the filling is firm. In a small bowl, whip heavy cream and sour cream together until stiff peaks form. Serve pie topped with prepared whipped cream mixture.